Aventura Mall and the Humane Society of Greater Miami have a long standing partnership of over 10 years. By supporting adoption programs and fundraising events at Aventura Mall, we've been able to give many dogs and cats a second chance of finding a furry forever family. Bring your furry friend out to Mark Light Field for the fourth annual Bark in the Park event, this year featuring TWO games. 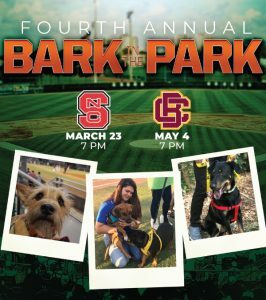 Join us for the second Bark in the Park ballgame on May 4th. Game packages are available for only $12 and include (2) game tickets (one adult and one K9) and a donation to the Humane Society of Greater Miami. You will also be able to meet furry adoptables from our shelter to make them a part of your "home team!" Be sure to use the promo code "BARK"!